There have been many great piano manufacturers through the years and while many of these companies are long gone their names live on through the relatively small amount of current piano builders. This list will serve as a guide to some of the more familiar brands being manufactured. The world’s largest musical instrument manufacturer operates piano factories in many countries and has been building pianos for over 100 years. Yamaha owns and controls all of its factories. All factories use modern machinery, much of which was custom built by Yamaha, along with Yamaha trained staff and quality control. Prized not only for their tone and touch, but also for their consistency and durability, they are to be found wherever musicians are making their mark. Long a leading choice of the finest schools and conservatories, Yamaha grands are equally prominent on stage at international piano competitions and performing arts organizations around the world. Grand pianos are manufactured in Japan sans the smallest grand piano which is manufactured in Indonesia. Vertical pianos 48” and under are built in Yamaha’s state of the art facility in Indonesia. Yamaha uses its vast acoustic piano knowledge in producing the fine line of Clavinova digital pianos and Hybrid pianos. Kimball is one of the oldest and well known U.S. piano manufacturers. At one time they were the largest keyboard instrument manufacturer. They began manufacturing pianos in 1886 and continued into 1996. 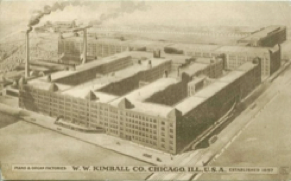 At that time Kimball ceased to manufacture pianos but is still a large viable company today. Known as Kimball International their office and hospitality furniture is very well known as well as operating a large contract electronics segment. Kimball pianos were all manufactured in the United States with the exception being some later model console pianos that were assembled in Mexico. Interesting to note that the made in Mexico instruments were short lived due to the fact that consumers didn’t want a piano, with a U.S. brand name, that wasn’t manufactured in the United States. There are currently other brands that are still manufacturing pianos along with relatively unknown factories producing “stencil” pianos with recognizable names on them. The brand names are always in a state of flux and must be researched at the time of purchase. Pianos with the Steinway & Sons logo are built in the New York factory which has recently installed some modern piano manufacturing equipment. Pianos with the Boston logo are manufactured by Kawai. To try to separate themselves from Kawai piano models they generally have a wider tail and a wooden vs plastic action compared to their Kawai counterparts. It is interesting to note that Steinway does not elect to use the wide tail in their own pianos. The entry level piano line is Essex. In an attempt to get into a lower price point the Pearl River piano company in China builds these pianos although some early models were built by Young Chang. Compare current models to their low cost Pearl River counterparts. If it doesn't stay Steinway across the middle of the key-cover then it is not made by Steinway. Pearl River manufactures and sells pianos under its own name and the Ritmuller brand. Pearl River’s factory and headquarters are located in China and have been in operation for just over 50 years. In 1999 they opened their first foreign subsidiary in the United States. That subsidiary has since closed and they are sold through a hired distributor. All pianos are manufactured in China. 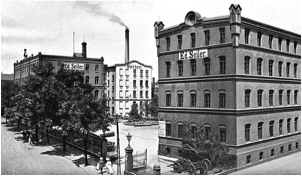 Schimmel was started in 1885 in Germany and is currently in its fourth generation of family management. They build their top of the line pianos under the Schimmel brand name with they Vogel and May brands rounding out their line. Schimmel made large investments in their company and technology in 2011. Schimmel grands and verticals are manufactured in Germany. Wilhelm pianos are built in Poland. May pianos are built in China. Fridolin pianos are built in China by Young Chang. Mason & Hamlin began building pianos in 1881. The company has changed hands numerous times in its history with current owners Gary and Kirk Burgett acquiring the company in 1996. The Burgett brothers also own the PianoDisc player piano mechanism company. Mason & Hamlin pianos continue to be manufactured in the United States. Bosendorfer started in Austria in 1828. While going trough a handful of ownership changes, including the Kimball Piano company for over 35 years and currently is a wholly owned subsidiary of Yamaha, they continue to manufacture pianos in Austria. Some notable models include 97 and 92 key pianos.